We regret to inform you of the passing of Rabbi Yosi Eisen. Rabbi Eisen spent six years as the OU-JLIC Rabbi at University of Massachusetts-Amherst where he worked with his family to create a home away from home for the countless students who came through his door. He strengthened the Kashrut on campus, empowered student leaders and enhanced the Shabbat programming on campus. Rabbi Eisen, with his warmth, humility and Ahavat Hashem worked to build a Torah community for his students. 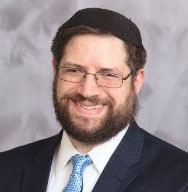 Rabbi Yosi Eisen served as the Orthodox Union Regional Director for Synagogues (New England and Eastern Canada) and Director of Post-Collegiate Outreach for Greater Boston. Originally from Memphis, TN, Rabbi Eisen studied at Yeshivat Kerem B’Yavneh in Israel. Rabbi Eisen held a BA in Math and Economics from Yeshiva University and an MA from Columbia University in Quantitative Methods in the Social Sciences. His thesis focused on emerging adulthood, an area of interest pastorally and academically. Rabbi Eisen completed additional graduate work in Consumer Behavior and Family Economics at the University of Wisconsin-Madison. Rabbi Eisen received Semikha from Rav Ephraim Greenblatt, his primary mentor, and further ordinations from Rav Michael Broyde and Rav Gedalia Dov Schwartz. Rabbi Eisen spent his life looking to give back to the Jewish community. He will be sorely missed by family, friends, students and alumni who were inspired by his example. He is survived by his parents, one brother, and twin children. The levaya will be taking place on Friday at Eretz HaChaim Cemetery and shiva will be at his brother’s home in Ramat Beit Shemesh.